All of our standard connector options are available for this board. The product photo above shows "RA1" connector on both H1 and H2. Please make your choice of connectors before adding this item to your shopping cart. Otherwise, the board will be shipped with the default option (no connectors on H1 and H2). With a 2K Flash-resident debug/monitor program, you'll be able to load your program into the remaining 126K Flash via the serial port using our uBug12JE graphical user interface for Windows/Mac/Linux. The entire 126K Flash can be programmed in under 12 seconds! To use the monitor for debugging or code-loading, just set the switch to LOAD. To run your standalone program thereafter, leave the switch at RUN. Your code runs from Flash, and interrupts are supported (via Flash-based pseudo vectors, since the monitor resides in the vector space of the MCU). A program you load into Flash this way will run every time you apply power or reset the board in Flash Mode. 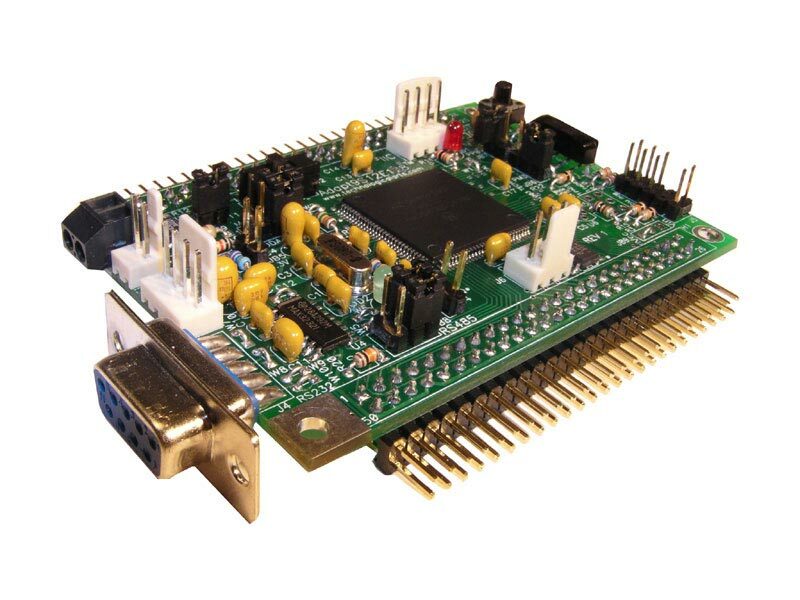 The Serial Monitor is also supported by Freescale's CodeWarrior Integrated Development Environment, for automatic erasing and loading of flash, and C source-level debugging. If you want to take advantage of a more advanced development tool (such as our USBDMLT pod), the entire 128K Flash can be used, because the Flash-resident bootloader is no longer needed (therefore pseudo-vectors aren't required either).